Joshua Garcia and Julia Barretto confirm upcoming movie with Robin Padilla and Sharon Cuneta. Julia Barretto and Joshua Garcia are doing another big screen project following the success of their film Love You To The Stars and Back. “May gagawin kaming pelikula. Very exciting ito with Ms. Sharon Cuneta and Sir Robin Padilla. Abangan na lang po natin ang magiging storya niya pero malupit po ito,” said Joshua during an interview at the IFLIX press launch of Love You To The Stars and Back. 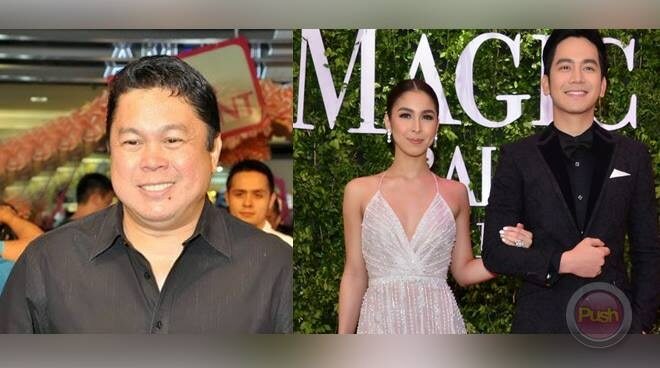 Julia, whose father Dennis Padilla worked with Robin on a bunch of films, is very much thrilled to work with the Bad Boy of the Philippine Cinema. “We were very shocked but at the same time, we really just grabbed the opportunity because this doesn’t happen all the time. We are going to be working with icons,” Julia said. Apart from Robin, Julia’s aunt Claudine Barretto has also worked with Robin in the past. “Parang makakatrabaho nila 'yung next generation so I am excited,” she said. Aside from the big screen project, Julia and Joshua are set to star in their first TV series together. “You will find out about it next month,” she teased. Meanwhile, Julia addressed reports that Joshua has been the only suitor whom she introduced to her father. “Siya yung unang napakilala sa dad ko because I believe what we have is something good. Meron akong faith sa kung ano kami,” she said. Thankfully, her hunch was right, “Alam kong makakasundo siya ni Papa. So, nagkasundo naman." According to Joshua, bonding with the comedian-turned-director became notably easy for him. “Si Tito Dennis, para siyang papa ko lang—komedyante lang, mabait, pero kapag nagalit, todo. So, same sila eh,” said The Good Son actor. Apparently, Joshua was able to bond not only with Julia and her family but also with her and her dad. “So, kapag nag-bonding kaming tatlo, talagang nagkakaintindihan kami. Kasi siyempre, para siyang tatay ko rin eh," he ended. Joshua and Julia first shared the screen in the top-grossing 2016 Metro Manila Film Festival entry Vince and Kath and James. It was then followed by Love You To The Stars and Back last August.